How and Where Do We Get Them Talking? The Be Here: Main Street initiative has been rolling in Minnesota for a few months now. Our partners at Water Bar & Public Studio are working with people in small-town communities to record personal perspectives about local places and waterways, happenings, and natural resources–all in an effort to balance out who’s perspectives matter. We often hear that history is written by the victors, and until the dawn of the digital age, that was largely true. But now, armed with smartphones and access to platforms where millions (even billions) of people could be listening, we all have the ability to publish our versions of what happened and why it was meaningful. Equally as important with this project, is the acknowledgement that voices of small-town, rural residents are as valuable as those of people living in large metropolitan areas–that no matter where you live, what your economic status or level of education, your story can help enrich the collective understand of a time or place. With this in mind, the question our team often grapples with is HOW to get people talking. In many places, particularly those where “outsiders” are seen as just that–as unwanted transplants who may try to impose their agendas on an unwilling community–the most critical step is to build trust. That trust starts with a lot of listening, no judgement, and the idea that the team is there to learn. Our Minnesota state coordinator for the project, Shanai Matteson of Water Bar & Public Studio, is the right gal for the job. She’s a consummate listener and knows how to get people to open up. One lesson she’s learned is that people have to see themselves as potential storytellers. If they don’t think their stories have value, they won’t contribute. Therefore, Shanai emphasizes the importance of lived experiences and personal perspectives, not just historical dates, names, and events. She reminds people that they don’t have to have a degree or letters behind their names to have an opinion, to be observant or share something poignant. The second thing that we’ve discovered is that where you’re asking them to tell their story matters. What type of social space are you in? Are you in the museum or out in the community? Are you in a formal space, like an office building or are you in a casual spot? Frequently, Shanai travels to the storyteller’s home turf, where they’re comfortable. In some cases, she’s made a pilgrimage to meet people in the place that the story is about–that provides a real sense of context and draws out details that might otherwise be missed. Shanai has found that people were more reluctant (and even a little antagonistic) in formal spaces that evoked process, bureaucracy, manners, and an established paradigm for proper behavior. Those spaces might be an office or government building, an art museum, etc. It’s no surprise really. Would you let your guard down at the office or in a space where there are guards watching you? So, what worked? The team held workshops in sort of neutral zone, a community center where they actually made a meal together and talked. The food helps. Making a meal helps. In it’s own right, there’s a sense of democratization there–everyone is part of the process. Nobody is being served. Shanai found that in this communal space, people just wanted to riff. They wanted to eat first, but they did want to talk. The stories just came. Interestingly, churches (or other places of worship) are spaces that might be betwixt and between the formal and the casual. These are places that tend to nurture cultural and spiritual life. More so, they are familiar and safe to the people who may already be part of a community there. 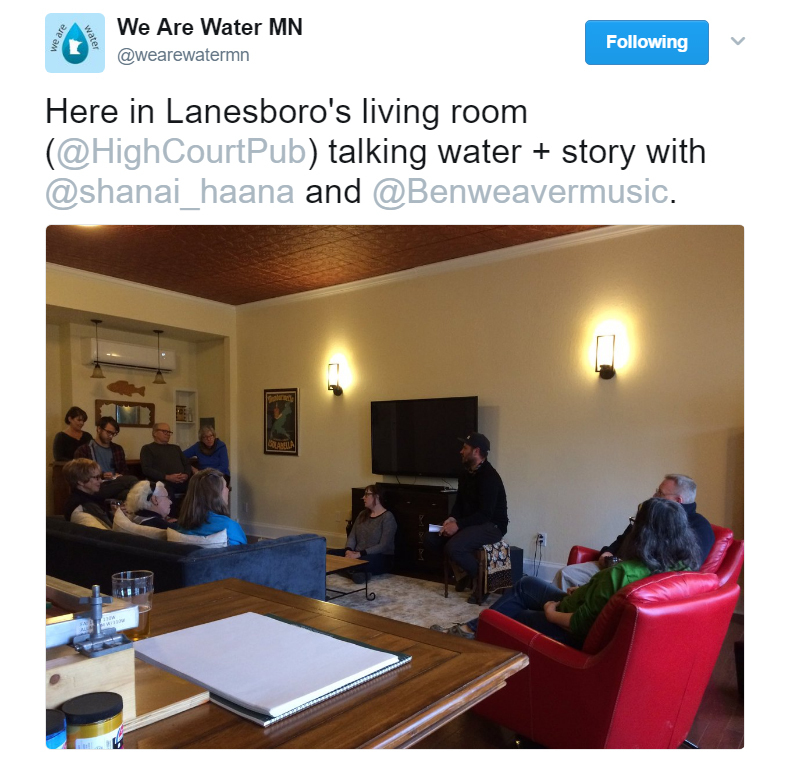 “We have been convening the group in Lanesboro, Minnesota, in the church basement, which is where people gather to eat and visit after church, and that has been a good space for this work to live,” says Shanai. Whatever space you choose, get out into the community. Be among the people, not above the people or even beside them. Create a space where talking and opening up is natural, not forced. Only then, can the story collector begin to think about building trust and turning on the recorder. Are pubs the next great collaborative partners for cultural organizations looking to build crowdsourced content? Let’s just say, the notion is brewing with possibilities. Convene a regular meeting group at a local bar, restaurant, bookstore, or community-oriented business. Host a trivia night at a local bar or restaurant. Have a regular booth / table at a farmer’s market or festival. Be present at sporting events or community art shows. Start a walking group where members can decide routes based on landmarks or experiences. Participate in a local parade. Within the museum or cultural organization, offer communal spaces where people can meet, use the Internet, eat or drink.